Don't get caught unprepared when a major appliance in your home breaks. Find the best protection from unexpected costs on home repairs, and keep all of your major systems running all year round. You just purchased your dream house along with the all the perfect décor that turns your dream house into your dream home. It's been a few months and everything is unpacked and placed in its designated spot within your new home. So you turn your attention to rebuilding your savings account since it was depleted from the biggest and most important purchase of your life. However, within a few months of living in your dream home, you experience a costly unexpected expense when your heater blows out during the winter. With a new mortgage payment and a limited amount in savings, you're looking at numerous financial options on how to pay for this unexpected expense. Fortunately, you purchased a home protection plan that will cover this expense as well as any major systems and appliances that may need repair or replacement in your home. 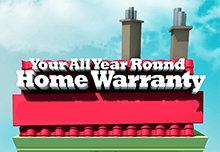 Home warranties are offered to all homeowners whether they are new or existing. Typically, home warranty plans are offered to the home-buyer when they are purchasing a new home. However, if the buyer decides not to purchase home warranty insurance simultaneously with their home purchase, then they can secure a home protection plan at a later date. There is no time restriction as to when a homeowner can decide to purchase a warranty plan. Typically, a home warranty costs a couple hundred dollars, which can be paid in a lump sum amount during the purchase of a new home. This lump sum payment would be collected at the time closing costs are due for the newly purchased home. However, the seller, real estate agent or a family member or friend can purchase home warranties on behalf of a home-buyer. If a home appliance insurance claim is filed then the homeowner may be responsible for paying a service fee or deductible that typically ranges from $50 to $100. Please note, home warranty companies have different contract agreements therefore, fee amounts may vary. Contact your home warranty insurance company to file a claim. The insurance company will review their home warranty plans to verify that you have a plan that covers the item in question. The insurance company will schedule an appointment for you with a local contractor. The contractor will diagnosis the situation and makes a recommendation to repair or replace the item in question. Repairs and replacements will be carried out. You will pay a cost in the form of a service fee to the insurance company. As there are many providers to choose from that have a variety of plan options; the best home warranty companies depend on how they can meet the needs of your home. The best way to select the right home protection plan for you is by doing your research on what each company has to offer with their plans. For instance, if you have a home with older appliances then you may be interested in locating a plan that has home appliance insurance. Want to learn more before choosing? Here are some tips and tricks to get you up-to-date. Convinced? Check out our expert written reviews for information on the top providers for home insurance. Once you've selected the plan that best fits your needs, you'll join the many homeowners that have peace of mind because they are protected by one of the top home warranty companies. Hot and cold weather can take a toll on your A/C and heating unit, which is why you need a home warranty plan to cover the costs of repair or replacement. See the best plans right here. Mother Nature is full of surprises, but one thing you can always count on is that your home warranty will be there for you when you need it. What does the average home warranty plan cost? The cost of the home warranty plan you select can vary depending on the level of coverage and the provider you select. Some plans can be as low as about $1 per day, or around $350 per year. More expensive plans can cost around $1,000 per year, but typically include systems such as garage doors that can be more pricey to fix or replace.With any home warranty plan you will have to pay a deductible at the time of service. This is typically a $60 service fee though this price can vary. How much you can save with a home warranty plan depends on the cost of the products you’re ensuring. With plans that cost around $1 per day, the cost of a single repair can pay for the membership. For instance, if you have to repair a washer or dryer, even with the price of the home warranty for a year and the service deductible, you could potentially still be hundreds of dollars below the price of replacing the appliance out of pocket.The biggest difference though can be with complicated home systems such as the air conditioning. In these cases, a home warranty can potentially save you thousands of dollars, but you’ll have to look very closely to make sure that the system is covered by your plan beforehand. A home warranty will cover appliances and systems in your house—such as washers and dryers or your A/C system—but will not cover the house itself. A home warranty can cover the cost to fix or replace these items that you have insured with the plan.Make sure to check what the plan’s payout limit is. Typically this is in the low thousands, so it may not cover the entire cost of replacing or repairing a major home system.